Geomorphology (Weathering, Erosion, Mass Wasting & Landforms). 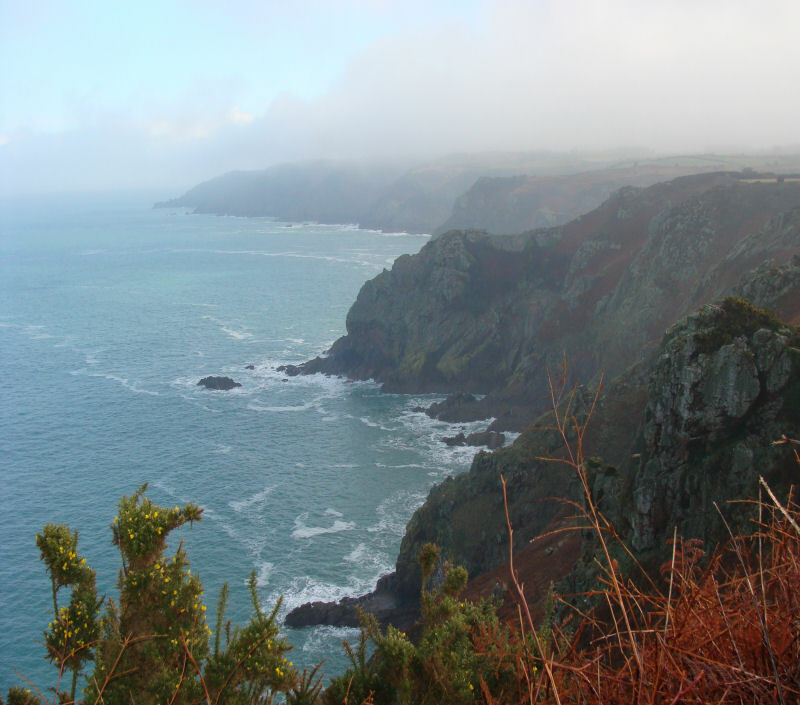 The geomorphology of Jersey involves the study of its landforms and shape which seem to have evolved over millions of years and are continuing to change. The geomorphology is easy to study and the coastal bays, inlets, headlands and cliffs are well exposed while inland the plateau surfaces, stream valleys and wetlands (marsh) areas are readily accessible. Geomorphology is the study of the physical features (landforms) of the earth's surface related to the geology. The processes causing the landforms present in Jersey are described under the usual textbook headings as follows; weathering which involves the physical and chemical processes that alter the rocks in situ in different climatic régimes and erosion which describes the abrasion processes which wear away the rocks in these different environments. In contrast, mass wasting describes denudation of the surface by movement of materials 'en masse' by soil creep, solifluction and landslide and in time past, gelifluction. Other processes associated with the above are transport and deposition which describe the movement and placement of the débris by wind, water and ice (not in Jersey). Each of these processes is characterised by another set of landforms. In Jersey, physical weathering is seen in the effects of root systems forcing rock apart along joints and faults, freezing and thawing during winter and burrowing which affects the soil profile. The effects of chemical weathering are seen in the colour variations of predominantly red and yellow, where oxidation and hydrolysis have altered the iron content of the rocks to haematite (Fe2O3) and goethite (Fe2O3.H2O; cf. limonite, the rock name) respectively. The presence of these minerals give the distinctive red, pink, orange and maroon colours to our igneous rocks and the yellow to brown colours to the greywackes and shales. Solution, in which the action of rainwater, a dilute carbonic acid (H2CO3) also occurs in Jersey but on a minor scale. These processes have affected the rocks, essentially by breaking them up or by changing the coherence of the grains (clasts) and the crystals and producing fragments of different size and shape. These fall under gravity and collect at the foot of the rock mass to form talus or scree. 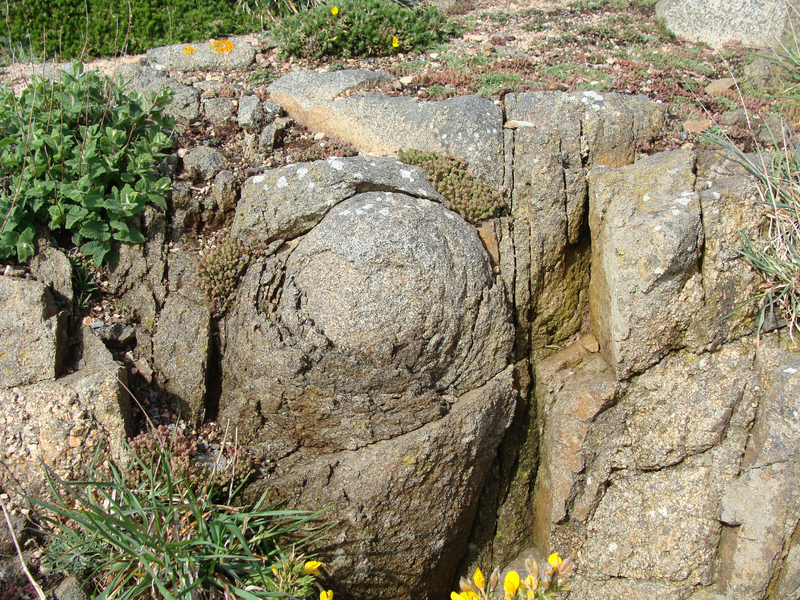 The effects of spheroidal weathering can be seen at the top of Sorel Point (below). In Jersey, erosion is predominantly marine with only minor fluvial along the shorter, steeper flowing streams. 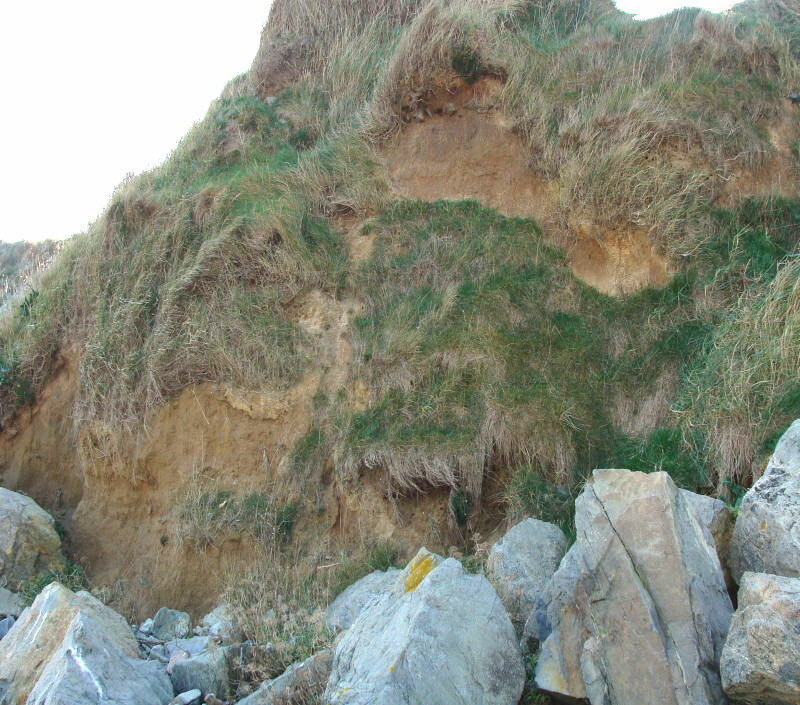 Very minor aeolian erosion occurs when dry beach sand is blown against any adjacent outcrops. Marine erosion occurs by hydraulic action when the air compressed in fractures and cavities by waves, explodes and breaks up surrounding rock. The fragments are then transported and abrade the cliffs by a process called attrition. In this way, cliffs of uniform rock composition recede as wave cut notches form at sea level and undermine the cliff until it collapses and retreats, eventually leaving a wave-cut platform. Present wave-cut notches can be seen around our coasts and those eroded in former interglacial periods when the sea level was higher can also be seen. Wave-cut platforms stretch out from our coastline in several places, notably at L'Étacq, revealing clear plan views of the folds and faults in the Jersey Shale Formation; between La Pulente and La Corbière (below left) revealing the SW granite and dyke relationships, and between St. Helier and the Royal Bay of Grouville, revealing the SE granite and its striking relationships between the various diorites, granites and dyke rocks. They also strikingly reveal the former extent of the island. The cliffs are under constant attack, but further erosion of the bays is prevented by sea walls built of huge granite and diorite blocks and concrete. Sloping aprons of either cemented blocks or loose ones occur at the foot of some to break the force of the waves. However, in strong gales and storms, onshore winds can drive high spring tide waves so powerfully that they break up the parapets and strew the huge blocks across the adjacent promenades. Our wonderful bays and coves occur where there are rocks of different hardness are jointed or faulted. In these areas, differential erosion occurs faster in the softer rocks and so produces bays and inlets. The extent of the softer outcrop determines the size of the bay. 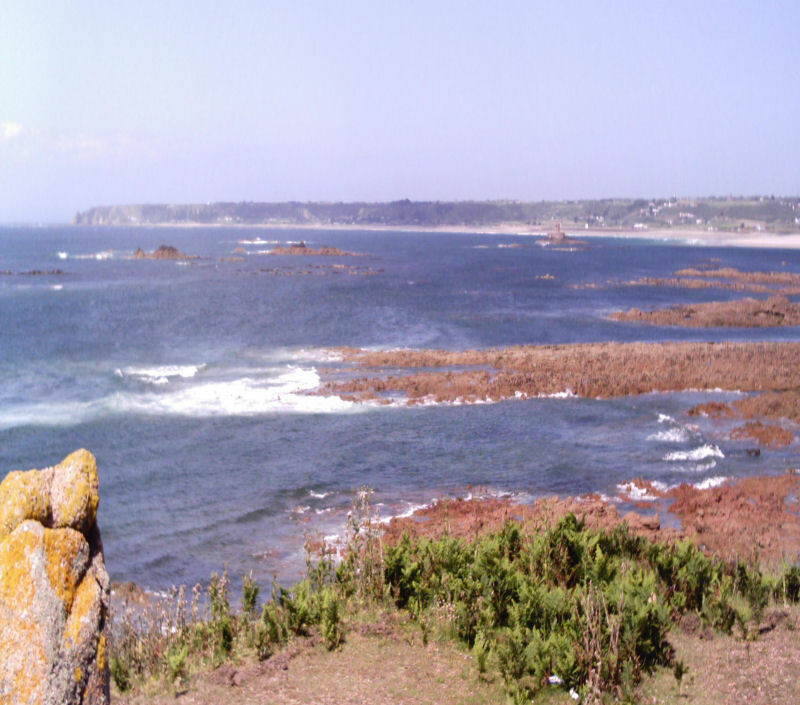 For example, the larger St. Ouën's and St. Aubin's Bays have been eroded in the wider outcrops of the softer Jersey Shale between the NW, SW and SE granite masses respectively. 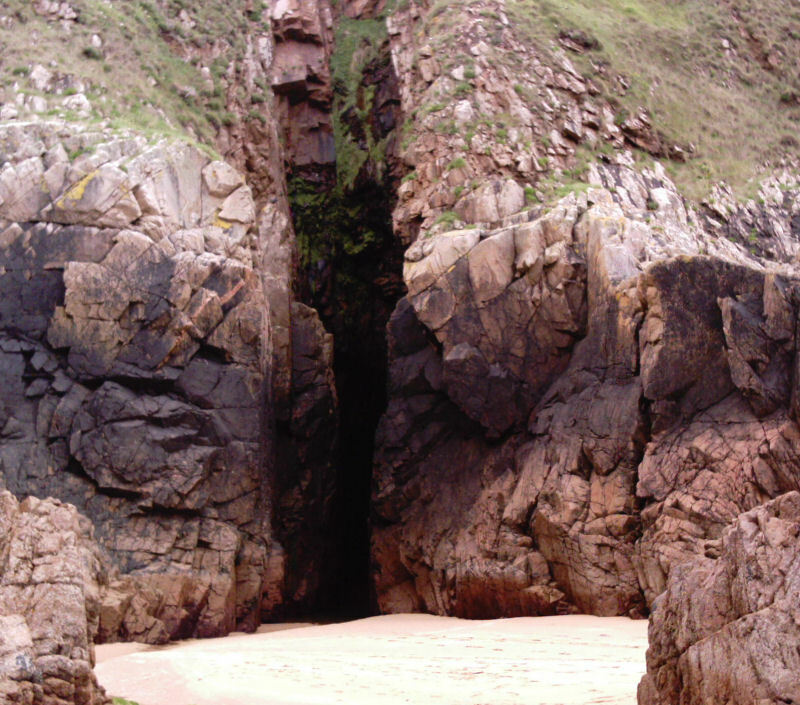 Where there are narrow, softer dolerite and lamprophyre dykes, faults and major (master) joints, wave erosion occurs faster along them and has produced narrow inlets and steep cliffs. 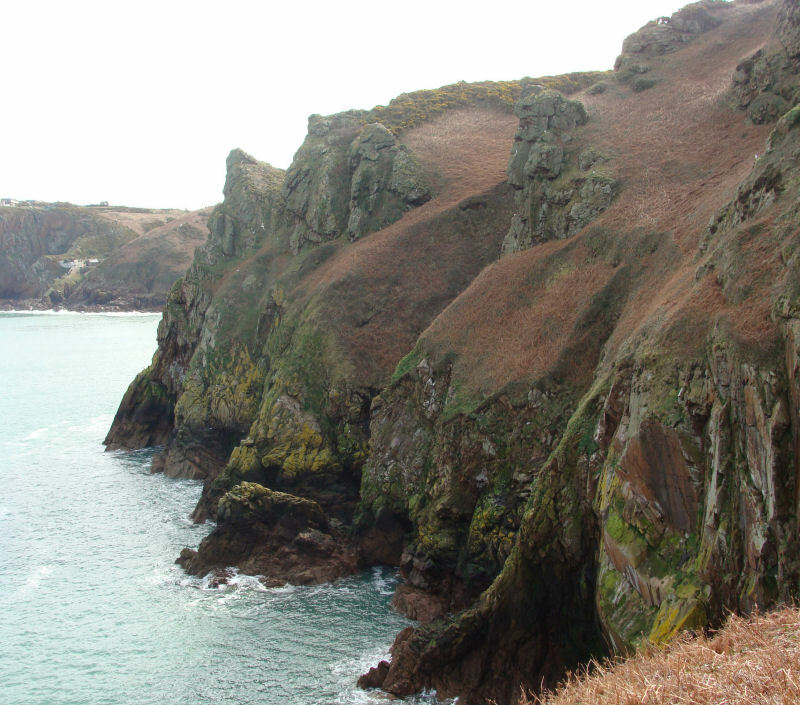 For example, erosion along master joints in the granites and diorites of the north coast has produced near-vertical cliffs side of Sorel Point (above right) respectively, while erosion of the steeply dipping beds of Jersey Shale by undercutting and slippage, has produced the lower, steep, seaward facing cliffs between St. Aubin and Belcroute Bay on the south coast. Erosion along similar structural features at right angles has produced caves, arches and stacks, and eventually reefs from collapsed stacks. Excellent examples of these are seen along Jersey's north coast, from Gros Nez Point, east via La Grève au Lanchon (Plémont) and La Grève de Lecq to Sorel and Ronez Points and Devil's Hole, while La Corbière lighthouse and several of the Jersey Round Towers have been built on stacks and reefs, for example, Icho Tower and the square Seymour Tower south east of La Rocque Point on the southeast corner of Jersey. Wave transport and deposition produce other landforms. 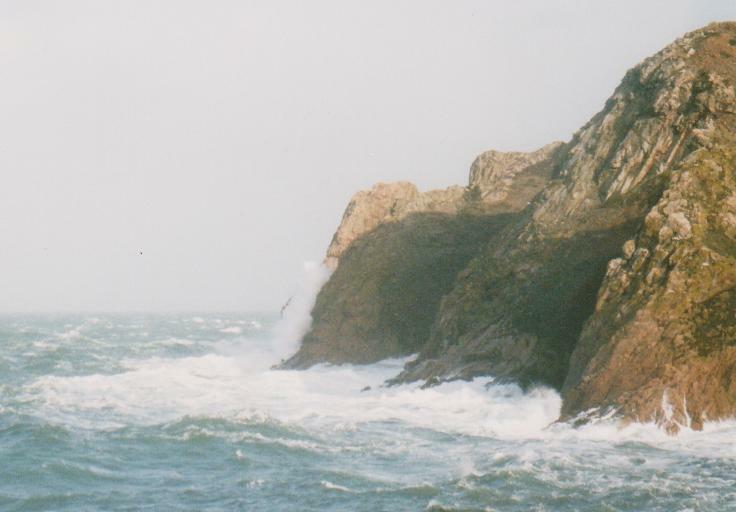 Wave refraction, clearly seen around the headlands and points, transports the eroded material along their sides and deposits it to form Jersey's excellent sandy beaches such as those at Plémont, La Grève de Lecq, St. Ouën's, St Brelade's and St. Aubin's Bays, and also in the Royal Bay of Grouville and the many sheltered coves. These beaches also allow one to explore the rock types in the surrounding cliffs. Subsequently, long-shore drift may transport the sand along the beaches depending on the prevailing wind directions. These change from SW to West and NW whenever low pressure areas cross us, and are generally easterly during high pressure systems, so at present our beaches seem stable. During Recent times, our great spring tide ranges have allowed the prevailing winds to blow dry sand inland to form the spectacular Les Mielles dunes arrested against the fossil cliff line at the back of St. Ouën's Bay (above). 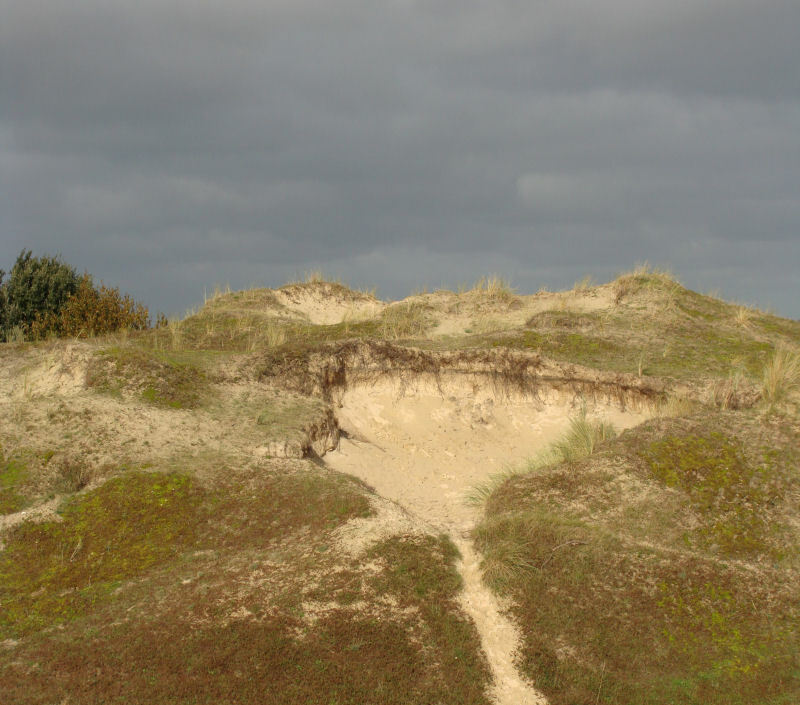 Other narrower dune areas occur along the south coast and at Grouville and La Grève de Lecq on the eastern and northern coasts. Stony beaches also occur, for example from St. Aubin to Belcroute Bay, Archirondel to St. Catherine and along the north coast at Bouley and Gifford Bays. They are fascinating geologically because of the variety of polished, well rounded rock types. These don't all come from the adjacent exposures and some beaches also have more flints than others. The textures and structures are clear and transect studies of the various types could lead to studies of their routes from their original outcrops. Fluvial action in Jersey is fascinating; there are no rivers, only streams, and these are rarely named, their courses being described only by the valley name. Erosion seems minimal at present but has been more powerful in the wetter, post-glacial period of times past which has produced a series of mis-fit streams. 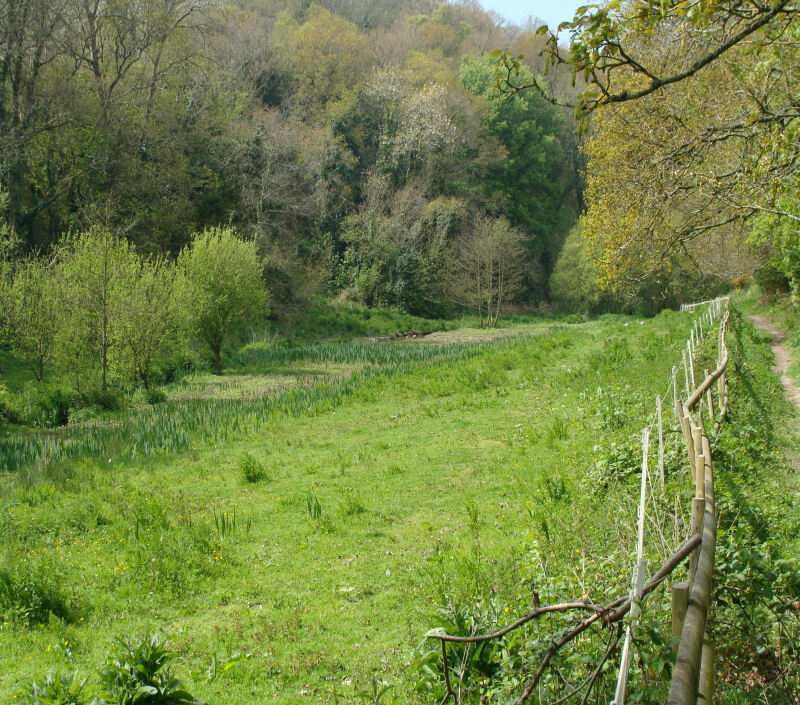 The gently southward sloping plateau surface is incised by long, relatively narrow valleys with flat floors, steep sides and small streams flowing gently southwards for relatively long distances, while along the northern, eastern and western edges there are short valleys with steep sides and faster streams flowing north, east and west. Here, some erosion is occurring and many of the north coast valleys are hanging between the cliffs whereas in St. Peter's Valley (below), the valley is mature, the floor is flat and the sides are steep as are those of its tributaries. Tributary valleys to the main ones are also relatively short with steeper profiles and more V-shaped cross-sections. At the heads of these valleys there are springs which can dry up as the water-table drops in dry conditions. 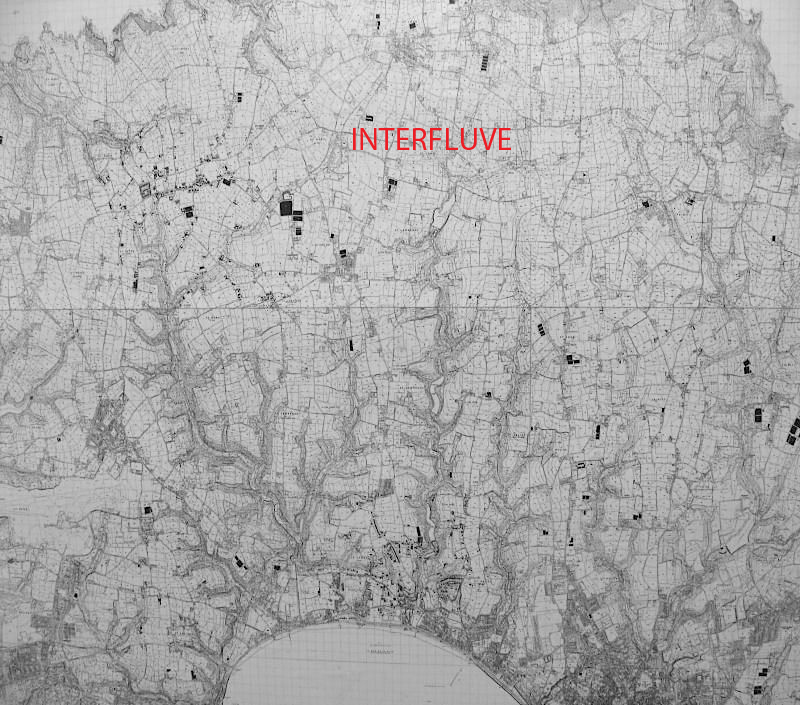 The interfluve strikes east - west c.2km from the north coast at about 100m above MSL and north - south along the eastern and western edges at about the same distance inland. On the north coast, the short, steep valleys have been left hanging spectacularly on the present cliffs. In general, this has produced dendritic patterns inland with some tributaries forming a trellis pattern (possibly related to any of the structural elements such as joint, fault or fold strikes). A radiating pattern occurs around the edges. With at least three raised beach levels (and further research is currently being done by Dr. John Renouf), the longitudinal profiles and possible knick points make the Jersey fluvial picture extremely fascinating. Deposition has occurred from the middle to the lower reaches of the main streams and c.3m of silt, mud over sand or gravel +/- peat have been recorded. Coastal marshes (les marais) also occur, notably in St Peter and Grouville; c. 6m of intercalated sand, peat and clay occur in St. Peter and c. 7m overlie lower clay and gravel in Grouville Marsh. Fossils indicate the areas were fresh water to brackish but with a marine period in St. Peter. Main dendritic, south - flowing streams with an east - west trellis tributary pattern. Ice erosion in terms of valley glaciers is absent but ice sheet action though not evident in Jersey occurred nearby and evidence of our periglacial position is seen in the glacial head on top of the cliffs, the gelifluction deposits and the loess over much of the island below the soil cover. The angular nature of the clasts in the head and the weak stratification in some deposits indicates freeze/thaw activity and movement respectively. The fine grained, yellow silty clay (loess) for example on La Motte (Green Is. )(below) shows that we were in the path of the cold out-blowing winds from the high pressure areas over the ice sheet to the north and east of us. Mass Wasting is occurring slowly on many of the valley sides (côtils) and on the sloping cliff tops. Soil creep causes the jointed and vertically bedded tops of the bedrock to be bent down-slope as the soil slowly creeps downhill; solifluction occurs when it becomes saturated. 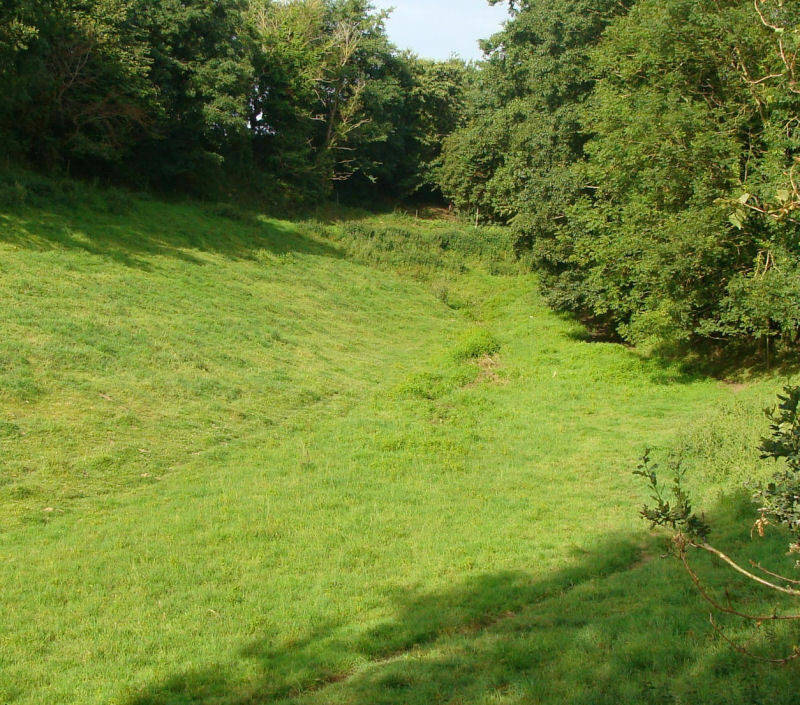 Whole sheets of soil may slide into the roads from the steeper, ploughed côtils and during prolonged, heavy rainfall these fields become runelled and soil-laden streams flow into and across roads and gardens, sometimes filling garages and swimming pools. Where there has been building in old quarries or on excavated terraces, or where roads have been made around cliffs, the slopes have been over-steepened in each case and these places are at risk from landslides in wet weather when the overburden becomes unstable. Recently, these areas have been stabilised by grouting with steel rods and discs, as along the Bouley Bay harbour; by steel netting which is spread over the cliff/quarry face, eg. above the car park on the east side of Le Mont de la Ville (St. Helier), and by the use of gabions, c.1m cubed steel mesh crates of rocks which are stacked in tiers against the cliff faces to form buttresses; these have also been used as sea defences, for example, on the south side of Anne Port Bay under Le Saut Geffray (Jeffrey's Leap). A two pronged defence has been made at La Motte (Green Is. ), an international geological and archaeological site. This site has been gradually eroded over the years but by building a low sea wall against the waves and by using green mesh and grass cover to prevent slope-wash of the loess overburden, it is hoped to arrest any further loss of the section. Bishop, A. C. & Bisson, G. 1989. 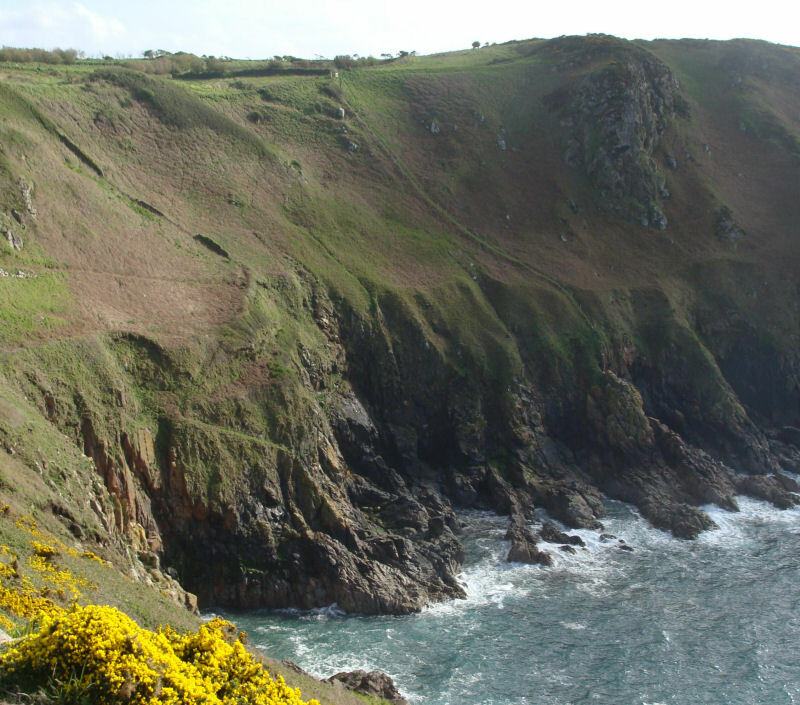 Classical areas of British geology: Jersey: description of 1: 25,000 Channel Islands Sheet 2. (London: HMSO for British Geological Survey). Harland. W. B., Armstrong. R. L., Cox. A. V., Craig. L. E., Smith. A. G. and Smith. D. G. 1990. A Geologic time scale 1989. Cambridge University Press. Jones, R. L., Keen, D. H., Birnie, J. F. & Waton, P. V. 1990. Past Landscapes of Jersey. Société Jersiaise. Keen, D. H. 1978. The Pleistocene deposits of the Channel Islands. Rep. Inst. Geol. Sci. No. 78/26. Mourant, A. E. 1933. The raised beaches and other terraces of the Channel Islands. Geol. Mag., Vol. 70, pp. 58-66. Mourant, A. E. 1935. 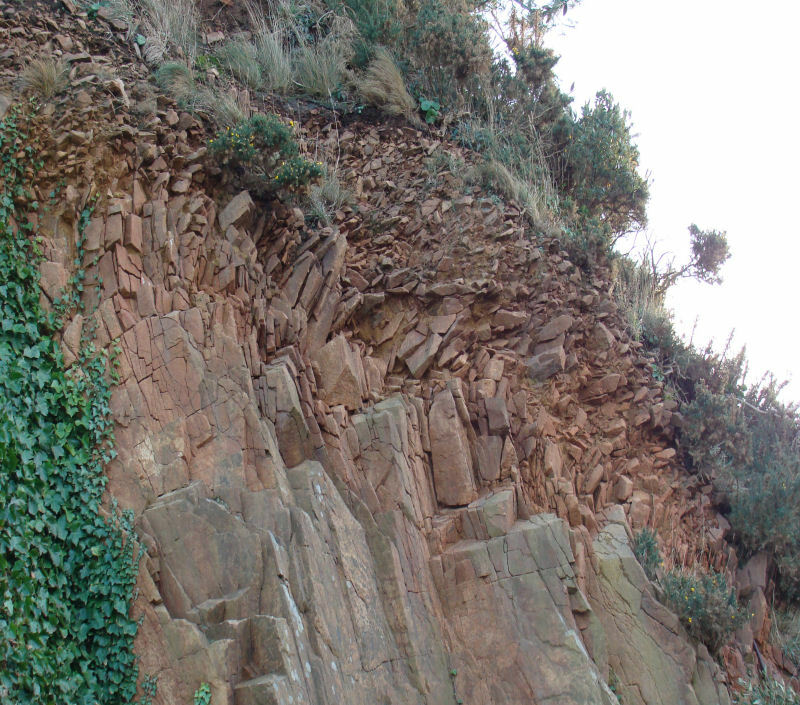 The Pleistocene deposits of Jersey. Ann. Bull. Soc. Jersiaise. Vol. 12, pp. 489-496. Roberts, H. M. 2008. The development and application of luminescence dating to loess deposits: a perspective on the past, present and future. Boreas, Vol. 37, No. 4. pp. 483-507. Wiley -Blackwell. Wintle, A. G. 2008. Luminescence dating: where it has been and where it is going. Boreas, Vol. 37, No. 4. pp. 471-482. Wiley-Blackwell.